Ross Lovegrove set up the Lovegrove and Brown Design Studio in 1986, then struck out on his own with Studio X. His work brings together materials science, new technology and sustainable development. 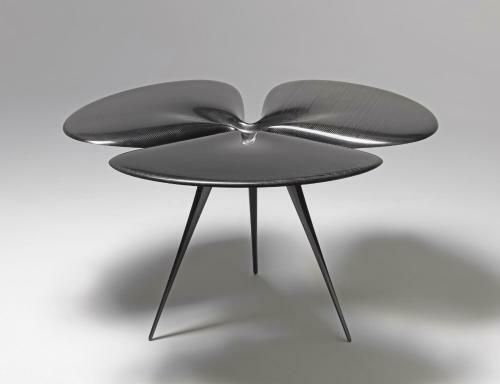 Between 2007 and 2008 he experimented with carbon fibre in the Gingko table. An allusion to the Gingko biloba, the first tree to have regrown after Hiroshima, the table is organised around an invisible “inner core”. Following the logic of plant growth, this central generative element unfolds the three petals of the double-skinned carbon-fibre tabletop.